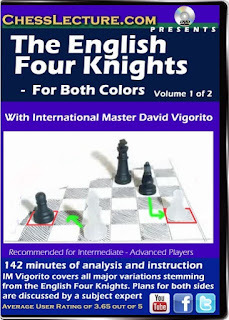 I recently completed the two-DVD set from ChessLecture.com "The English Four Knights - For Both Colors", which is presented by IM David Vigorito. This is my first experience with ChessLecture, which has been around for a while. In terms of production values, it's a no-frills DVD, with a rather basic-looking 2-D board and audio narration. So in that respect it doesn't provide extras like the ChessBase Fritztrainer products' interactive quizzes, included databases and live video of the presenter. However, as long as the substance is sound, I think the extras are just that - extras - and the basic lecture format is still effective. 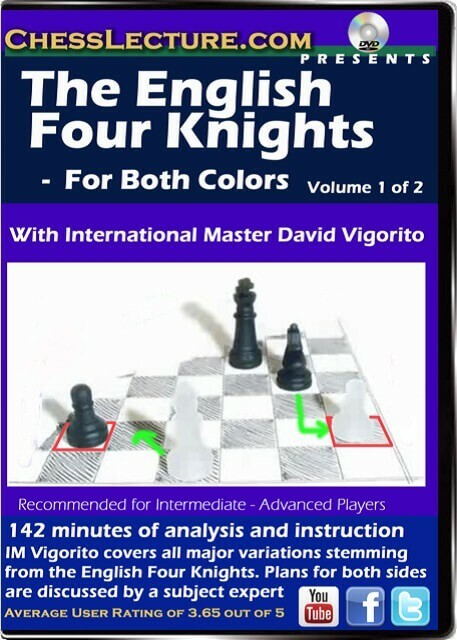 As a longtime player of the English, I used this product to supplement my understanding of the different Four Knights variations and get a more professional perspective on my preferences. IM Vigorito does a good job covering the breadth of options for White, looking at all of the realistic move four White options (4. a3, d3, d4, e4, e3 and g3, in ascending order of popularity) as well as helpfully touching on some earlier move-order options for both sides, particularly after an earlier g3 by White. If you play the English as White, then especially at the Class level the Four Knights will likely be encountered very often, so you should have one of the major lines prepared. As Black, it's a good choice for a defense, with a lot of natural moves. Unlike the case with many opening products, IM Vigorito does truly present the opening from the point of view of both sides, without evident bias and balanced content. He has personal experience with both White and Black in these lines, which helps. The lecture provides additional depth of understanding in many lines by explaining how certain move alternatives don't work, including common ideas that you may well encounter over the board at the Class level, rather than simply focusing only on the "best" theoretical lines. I value this because it really helps with learning the "why" behind opening lines and what you can do to take concrete advantage of deviations made by your opponent. From the point of view of an improving player, it was in fact helpful to look at the entire lecture series, rather than just the ones that pertained to my particular repertoire choices. IM Vigorito provides insightful commentary throughout on typical setups, traps and concepts which can be applicable to similar position-types, or that are just good to know in general for your chess. In my own case, I think being less narrow-minded and understanding how different openings work has been important to strengthening my overall game. The DVD lecture is good for either a first intro to the Four Knights, or as supplemental material for study; it's not comprehensive and doesn't pretend to be. I found it a little short on the 4. e3 variations, although they generally get good treatment, and there is just too much theory on 4. g3 to be looked at in real depth, although the various major choices are presented well. IM Vigorito notes this himself and points out where you will need to be much more independently booked up if you decide to play certain variations.